The Travel Curmudgeon – Discovering culture and cuisine while exposing the injustices of travel! ANYWHERE, Earth – April 9, 2018 – The Travel Curmudgeon (TC), a legendary anonymous traveler with worldwide recognition from the oilrigs of Galveston to the sinking streets of Venice, announced the significant milestone of sharing more than 500 stories, experiences, and advice to thousands of fans in just three years. The Curmudgeon has already shared stories from the well-beaten path to obscure destinations while gathering an impressive social following with thousands of fans worldwide. He tells it like it is in a full frontal and curmudgeony tone that only he can deliver. 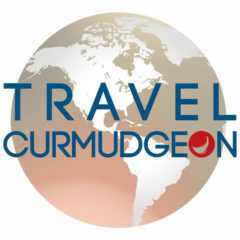 The Travel Curmudgeon gained early fame through timely travel insight covering hard-hitting topics like fee-crazy airlines, and bed-bug friendly hotels, but only began sharing his experiences of the trials and tribulations of cold airline coffee and Airbnb bedroom cameras with an international audience online in 2015. Prior to blogging, the Curmudgeon provided commentary for PBS and radio in which he reported on the wildlife and natural wonders of the Galapagos Islands, dined in Beijing at the Great Hall and interviewed Sesame Street’s Big Bird! While the official three-year anniversary of the Travel Curmudgeon blog was April Fools’ Day, make no mistake – all of these impressive achievements are, in fact, a reality all made possible through the fan support and fast-growing following, as much as the unsupportive airline customer support and lackluster hotel and wait staff that provide the Curmudgeon with endless material. As the Curmudgeon looks toward the future, he will continue to provide hard-hitting, controversial content from the road as he follows Oprah on the campaign trail, goes undercover at a Moscow-based Facebook hacking center, and finally catches the long-awaited Southwest flight to Hawaii (though he’s still not sure when that day might come). The Travel Curmudgeon can be found on his website, travelcurmudgeon.com, or his social media pages on Facebook and Twitter, spreading travel tips, and good humored fun to an ever growing fan base.